The Chicago Sky announced the first 2014 “High School Team of the Week” winner Wednesday. The Glenbrook United girls basketball team have earned the honor after being nominated for their outstanding efforts and achievements within their team and local community. 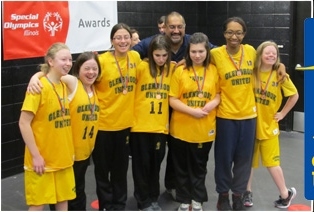 The Glenbrook United girls basketball team started in 2010 as part of Glenbrook School District 225’s Special Olympics program. The program encompasses several schools including Glenbrook North, Glenbrook South and neighboring off-campus high school students. The team began with just five players. Those five worked together as a team to earn a spot at the State Tournament. The team has continued to find success, earning three State bronze medals and clinching their fourth consecutive entry to the State Tournament after qualifying for the 2013/2014 season. The Glenbrook United girls basketball team is fully funded by donations. The athletes have been actively involved in helping raise money through a variety of fundraising activities to afford them the opportunity to continue to play basketball. As a Chicago Sky “High School Basketball Team of the Week” award winner, Glenbrook United is invited to enjoy a Chicago Sky game, where they will have the opportunity to watch the world’s best female basketball players. During the game, they will be honored on court. All teams that compete in IHSA class 1A, 2A, 3A or 4A competitions are eligible to win a weekly honor. Nominations from parents, coaches, school faculty members and players are welcome and should be completed on the Chicago Sky website through March 12. At the end of the 10-week program each weekly winning team will be entered to win the “High School Team of the Year” award for 2014. The winner, determined through online voting, will be announced at halftime at a 2014 Chicago Sky game.